JOHANNESBURG — One of the world’s largest urban forests is under threat from a tiny beetle. The polyphagous shot hole borer is thought to have made its way to Johannesburg from Southeast Asia on packing crates or through the trade in plant materials. Trudy Paap, a forest pathologist at the University of Pretoria, discovered the beetle in the Pietermaritzburg Botanical Gardens last year. She published her discovery in the journal Australasian Plant Pathology, calling it part of “the surge in the global spread of invasive forest pests” because of globalization. The beetle has since moved to Johannesburg, 200 miles away, and spread across its urban forest, which according to the Massachusetts Institute of Technology initiative Treepedia has the world’s sixth-largest green canopy cover. Today, many of Johannesburg’s estimated 6 to 10 million trees are dying, a crisis obscured only by the current winter season. Some of the infected trees have the telltale holes the 2-millimeter-long beetle makes in their bark. The trees do not have an evolved resistance to the polyphagous shothole borer, unlike in Asia where the beetles naturally occur. An arboreal murder mystery: What is killing beech trees? The trees are dying in three states and Canada, and scientists still don’t know why. Ohio biologist John Pogacnik admits to mixed feelings about having discovered the latest disease imperiling a major American tree. Pogacnik first noticed American beech trees with striped and shriveled leaves in 2012 during a routine survey of forests owned by his employer, Lake Metroparks. He didn’t think much of it at first: Just a few trees looked sick, and it had been a strange year, with an unusually warm winter and dry spring. By the next summer, Pogacnik was seeing ailing trees throughout the six-county region in northeast Ohio where his agency manages more than 35 parks. He alerted colleagues at the Ohio Division of Forestry and the U.S. Forest Service. 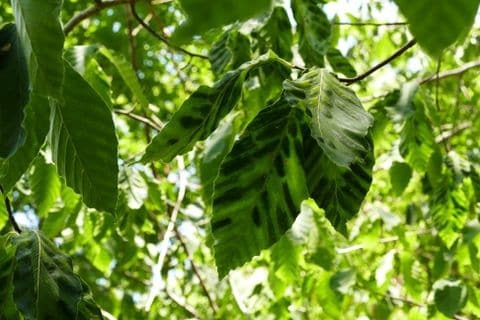 Beech leaf disease has now popped up in nine Ohio counties, two other states and Canada, and its spread shows no sign of slowing. The disease has already felled young saplings; mature trees, some hundreds of years old, appear to be on the brink of death. Scientists fear the beech could soon face a plague as serious as those that have devastated chestnut, elm, hemlock and ash trees. “It has all the signs of a significant, emerging pathogen,” said Constance Hausman, a biologist at Cleveland Metroparks. Scientists are gearing up to fight back, but they face a major challenge: Nobody knows what beech leaf disease is. Searches for a virus, bacteria or fungus — all common tree pathogens — have come up empty. Researchers are facing an arboreal murder mystery. Laurel wilt is caused by Raffaelea lauricola, a fungal pathogen transmitted by the ambrosia beetle Xyleborus glabratus. 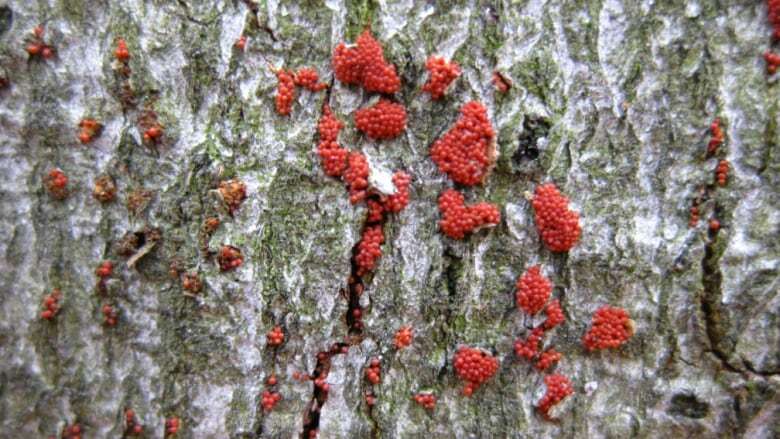 This beetle and fungus are native to southern Asia, and the beetle was first detected in Georgia in 2002. This disease impacts several trees in the family Lauraceae, including redbay, sassafras, pondspice, bay laurel, and avocado. Extensive mortality to redbay has occurred in coastal areas from North Carolina to Mississippi, with detections also occurring inland in Alabama, Louisiana, and Arkansas. Infected trees generally die within months, often showing a full crown of dead, brown leaves. There is no cure once a tree has this disease. Preventing the spread of this disease by transporting firewood is of the utmost importance, as management options are limited. Current management involves sanitation (chipping, burning) of infested material, and chemical treatments may be effective for high value trees. This fungus may be called many names – including annosum root rot, annosus root rot, or Heterobasidion root rot – and is caused by Heterobasidion irregulare (formerly named Heterobasidion annosum and Fomes annosus). This fungus is present throughout North America, has a very wide host range, and is commonly found in southeastern U.S. forests. The fungus causes root decay, although infected trees may survive for many years after infection. Weakened roots are at an increased risk of windthrow. Infected roots generally show heavy resin leakage, and the spread of the fungus through root grafts may cause pockets of tree mortality. Fungal spores are also spread by wind, and often infect stumps from recently harvested forest stands. Annosum root rot is most common on deep, sandy soils or former agricultural land. Prevention is the best way to manage this disease, but post-treatment of stumps with borax can limit fungal spread.